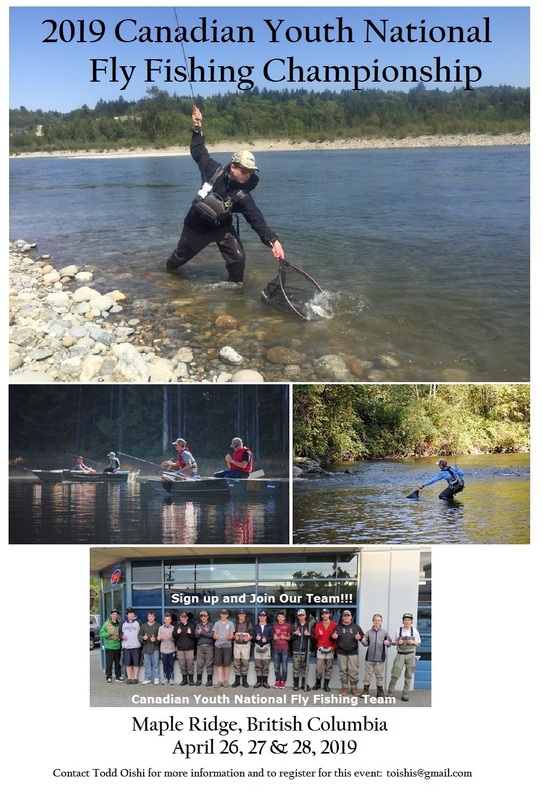 Maple Ridge, British Columbia will be hosting the 1st Canadian Youth National Fly Fishing Championship from April 26 - 28, 2019. Young fly fishers across Canada are encouraged and invited to participate at this championship. This event will be a celebration of fly fishing and a great opportunity for young fly fishers to learn more about this sport and make new friends. The top 10 competitors will qualify for a spot on the Canadian Youth National Fly Fishing Team and the opportunity to represent Canada at upcoming Youth World Fly Fishing Championships, as well as a variety of other championships. Several Coaches of the Canadian National Youth Fly Fishing Team will be on hand to mentor and assess the participants. The four 3-hour sessions of this championship will be held on 2 lake venues and 2 river venues within the Fraser Valley. Competitors should already know how to fly fish and have a good understanding of knots and casting. Competitors are responsible for providing their own waders, fly fishing equipment, nets, and flies. Boats will be supplied for the 2 lake sessions. - Eligible fish species: Rainbow Trout, Cutthroat Trout, and Whitefish. - There is a total of 4 sessions of competition (2 sessions per day). - Each session consists of 3 hours of angling. - 2 Stillwater sessions will be fished casting in drifting boats. - 2 River sessions will be fished from the river bank, with wading restricted to thigh-deep water. - Competitors must wear life vests and eye protection at all times when near or on the water. - All fishing must be performed with a single, barbless fly. - The use of strike indicators, scent, swivels, and split-shot are forbidden. - All competition venues are closed to fishing as of April 8, 2019 for all competitors and their agents. *All competition venues are closed to fishing as of April 8, 2019 for all competitors and their agents. - Registration for this event is now open! - Competitors must be Canadian citizens that are between 13 to 18 years of age at some point during the 2019 calendar year. - Maximum number of participants: 24 competitors. - Competitors may register as individuals or teams. - Individual competitors will be assigned to a team or may form their own team. - Teams will consist of 4 competitors. - Registration will be accepted on a first come, first served basis. - Registration fee: $125.00 per person (includes: transportation, 2 boxed lunches, and dinner at the closing ceremonies). - Payment must be received by February 28, 2019 in order to secure a spot for this event. - Please send your e-transfers to: chrispuchniak@shaw.ca or contact Chris Puchniak for his mailing address if you wish to send a cheque or money order.